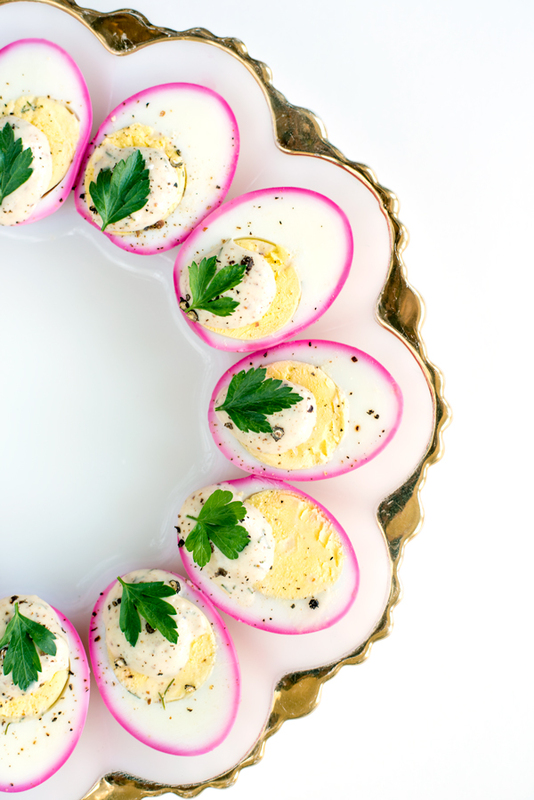 Bright pink beet-dyed mustard ranch deviled eggs are stunning and easy to make. 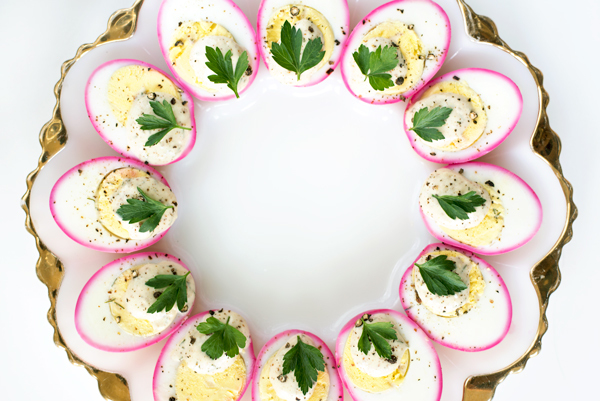 They are the perfect way to use up hard boiled eggs and they make a great appetizer. I’ve never needed an excuse to get friends together for a celebration. 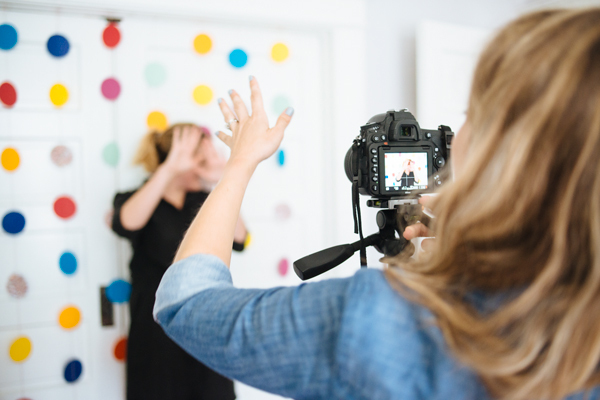 Especially with blogging, I’m always wrangling girlfriends together for some hair-brained scheme, whether I need hand models or people to pose in front of a photo booth. A while ago I hosted a confetti party. There were two reasons for the party – one, I finished a rough stretch at work with mostly night shifts, meaning I had basically dropped off the planet. I wanted to get everyone together to reconnect over drinks and snacks. 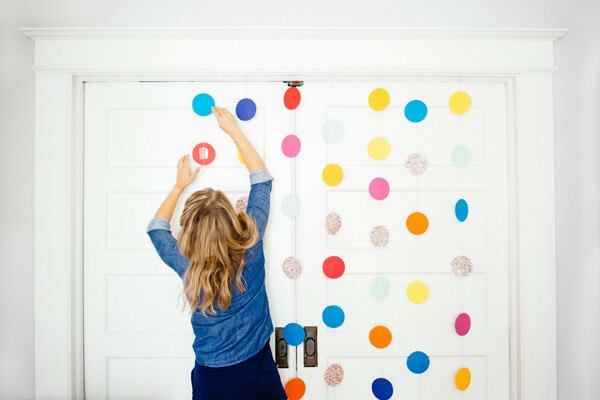 Plus, I needed a party spread to highlight the balloon party centerpiece DIY I was working on for Martha Stewart. Why go to all of the trouble of making the decorations, recipes, and libations for a photoshoot if you can’t have people around to share them? I’m lucky to have a creative group of girlfriends I can call upon for a party – even if it is a semi-fake one that is full of blog projects! Katie did the beautiful rainbow calligraphy menu and invitations, Ashley mixed the cocktails and Melissa was there with her camera to capture the day. Even though I’m the shortest one, I somehow ended up with the task of hanging up the colorful photo booth backdrop. Even though Sherry couldn’t come, she sent over the pretty vintage deviled egg platter you see in these photos. 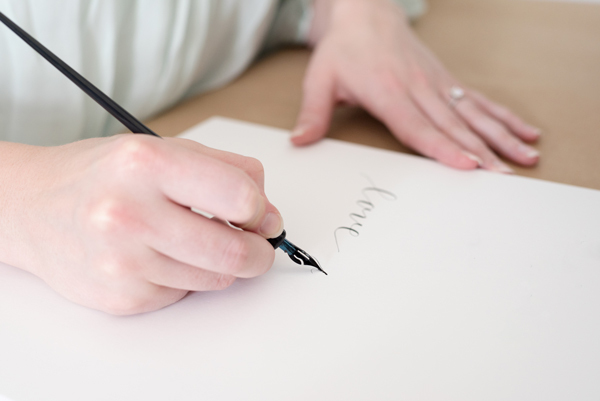 Side note – you know you’re a blogger when each of your friends has her own website, right? As I mentioned, these beet-dyed deviled eggs were part of day’s spread. The vibrant pink color of the deviled eggs comes from natural beet dye. A dollop of mustard and ranch on top tastes amazing! I also love that you don’t have to mix up the yolks and pipe them back into the egg – it’s so easy and gives it a classy flare. You absolutely have to try them. Thanks so much for reading A Side of Sweet! 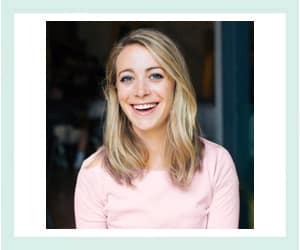 For more Sweet in your life, you can find me on Instagram, Snapchat (@asideofsweet), Pinterest, Facebook, Bloglovin’, or Twitter, or subscribe to receive a weekly email with new posts (see sidebar). Hard boil eggs: I like to place them in a large pan, cover with cold water and heat over medium heat until boiling. Cover, remove from heat and let sit for 12 minutes. Immediately transfer to a bowl containing cold water to stop cooking. Best peeled immediately. Heat the vinegar, water, sliced beets, sugar and salt to a boil in a small saucepan. Turn off heat and let sit for 5 minutes. Strain out the beets and let cool. Transfer to a zip lock bag and place the peeled eggs inside to marinate at least an hour in the fridge. 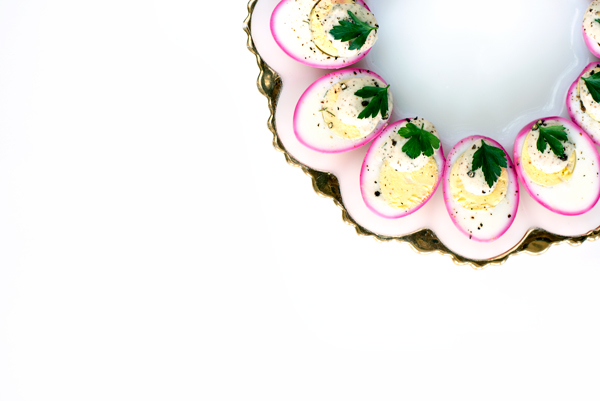 To make the deviled eggs: In a small bowl, mix the ranch dressing, mustard, cornstarch, and dill. Slice in half lengthwise and top with a dollop of the mustard ranch mixture. Top with a parsley leaf and freshly ground pepper. WHAT! 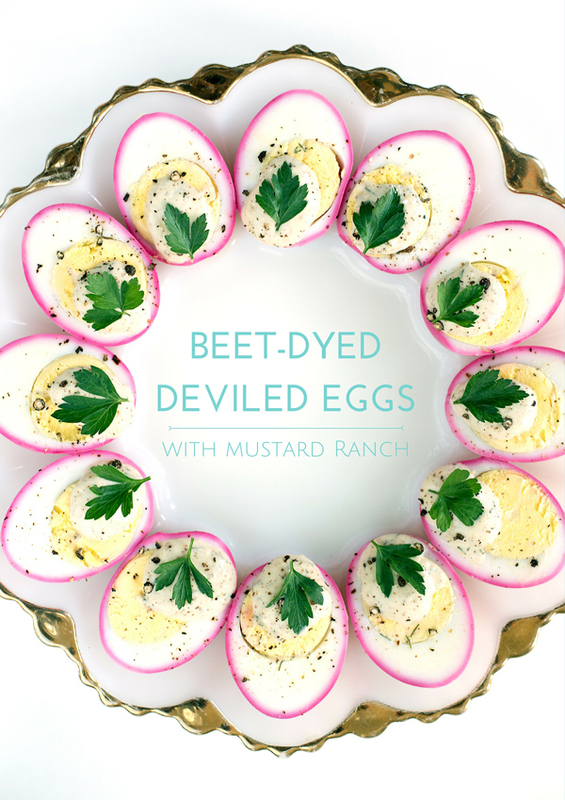 So cool – love the pink beet eggs! Thanks Nancy! They are worth the extra step! This is gorgeous!! I need to try this! You should! They are definitely show-stoppers! I juts came back from S.F. and we had deviled eggs a few times during our visit. Ive been thinking about making them and now this is in my feed 🙂 I have to give it a try, do you mind if I share on my site as well? with credit to you? Hooray! I would love that! Can’t wait to see how they turn out! We have them at our Good Friday get together every year & picnics. Will definitely try this. 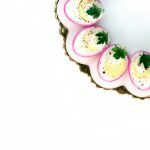 I have heard of died egg salad but this is cool. It is just on the edges. I also like the Ranch dressing idea. Not a big fan of the mayo. Wait lol…I just realized you didn’t mix the ingredients with the yolk. You left the yolk in the egg & just put the other ingredients on top? i agree with karen. love the pink and green, but why deconstruct it so the yolk is not mixed? takes away the best aspect of a deviled egg! not proper, not at all. I must be dense. I am not sure after you put the eggs in the mixture do you just take out the beets and leave the rest of the liquid in with the beets to absorb the color while they are in the fridge? You pour the mixture into a bag without the beets in it and then add the eggs to the bag! Wondering why oh why have I never thought to combine two of my favorites such as deviled eggs and pickled eggs into one! Can’t wait to try this. Thanks. These aren’t strong enough that they actually taste pickled, but I bet that would be great too!